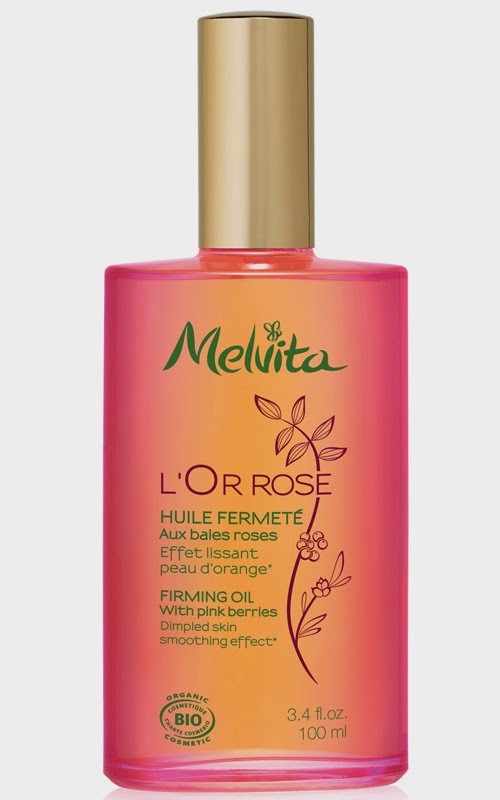 Melvita L'Or Rose Firming Oil combines effective action with the luxury of a divine massage ritual that visibly reduces the appearance of cellulite for firmer, smoother skin this summer. The dry oil is the No1 best seller in French pharmacies and since launching in France in April 2014, 13,834 have been sold, which adds up to the height on 6.5 Eiffel Towers! This naturally effective dry-oil can be massaged into the skin following the shower in place of body lotion. For best results, apply L'Or Rose twice daily, massaging into the skin with circular motions, starting at the lower thighs and working up to the hips. To maximise the skin firming benefits, and boost penetration, exfoliate the skin before applying, or use a body brush to break down fatty deposits. The oil nourishes, hydrates, has a delicate scent and an incredibly soft, dry-oil feel. The scent of L'Or Rose combines zesty top notes of Pink Pepper, Lemon and Bergamot; floral heart notes of lavender, spearmint and peony and a base of White Iris, Vetiver and Ambrette seeds. The product tackles the appearance of cellulite working on lipolysis and lipogenesis, after using the product, adipocytes size will decrease, releasing the 'pressure' on vessels. The product contains powerful organic actives: the combination of Pink Berries, Sea Buckthorn and Black Pepper helps to fight lipogenesis and boasts lipolysis. Meltiva was inspired to use Pink Berry oil which has a slimming and detoxifying property and boosts microcirculation and promotes drainage. Sea Buckthorn seed oil helps waste drainage and facilities the elimination of toxins and is rich in Vitamin E for softer, supple skin. Black Pepper oil is known for stimulating blood circulation and promotes the breakdown of adipocytes. Rosehip oil is rich in alpha-linolenic acid and helps to revitalise and moisturise skin and improve elasticity. 99% of the ingredients are from natural origin and 36% of the ingredients are from Organic Farming. Melvita conducted a study and after 14 days 83% of women said their skin seemed smoother and after 28 days, 69% of women noticed a reduction in the visible appearance of cellulite and 79% of women said they would recommend the firming oil to a friend.